I wanna reconfirm that I do like spaghetti cooked with dry wine, and it’s unforgettable if white wine is combined with shrimp. You are wondering the outcome of that mixture, aren’t you ? I believe you will have no regret for making this dish. Spaghetti is the most interesting pasta I like among the uncountable Italian noodle because spaghetti is not so thick like fettuccine but is firmer than linguine. I also like combining caramelized onion or anise with spaghetti. Try it and let me know your result. – grill the red pepper until it’s blackened outside then put it into a bowl and cover for 15 minute. – after 15 minutes, peel the grilled pepper and slice it thinly. – heat oil and add the white part of anise. Stir fry until it’s soft for around 15 minutes. 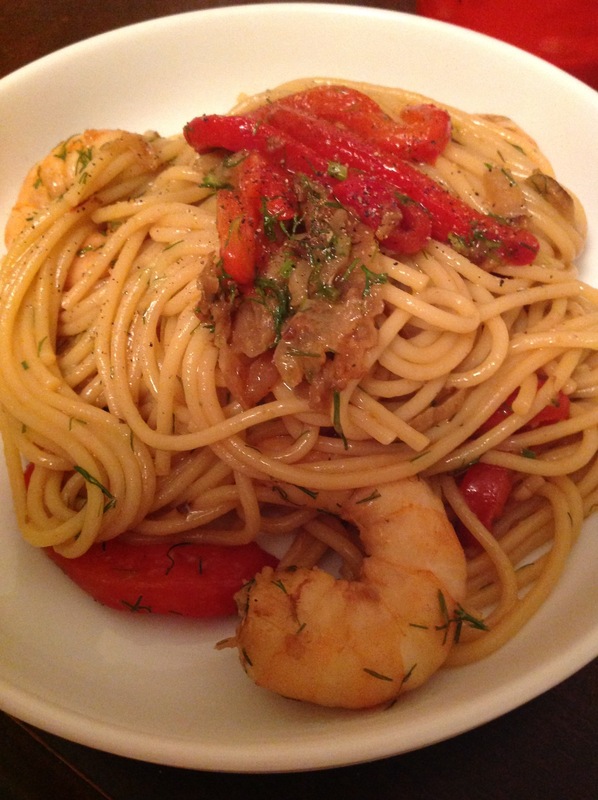 This entry was posted in Italian, noodle, pasta and tagged Italian, Spaghetti. Bookmark the permalink.